This article describes why and how Pandunia was created to be an equally global auxiliary language. Many people are used to seeing this kind of world map. It is the famous Mercator projection map. Unfortunately it distorts the land area terribly. Why is that? The world is a 3-dimensional globe and drawing it into a flat, 2-dimensional map is not easy. Equal-area projections, such as Peter's projection below, show land areas correctly. 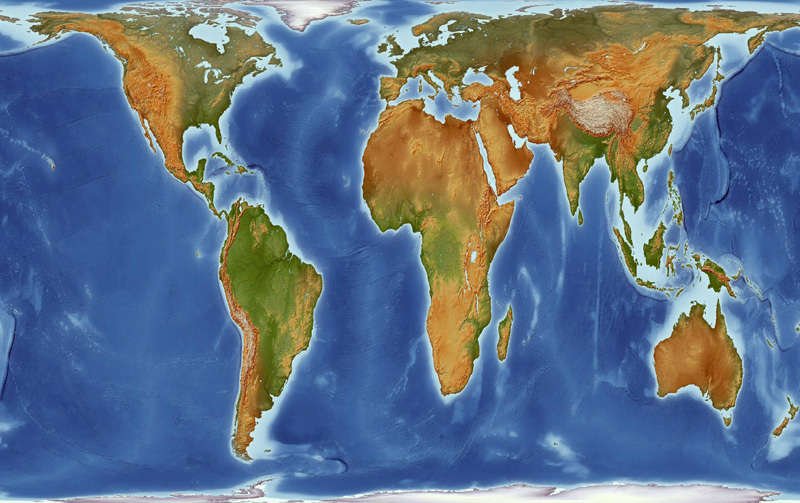 Compare the sizes of Greenland and Africa in these two maps. In the Mercator projection Greenland appears bigger, but the Peters projection shows correctly that in reality Africa is 14 times bigger than Greenland. That is the natural world. We live also in a human world, which is divided by borders between nations. 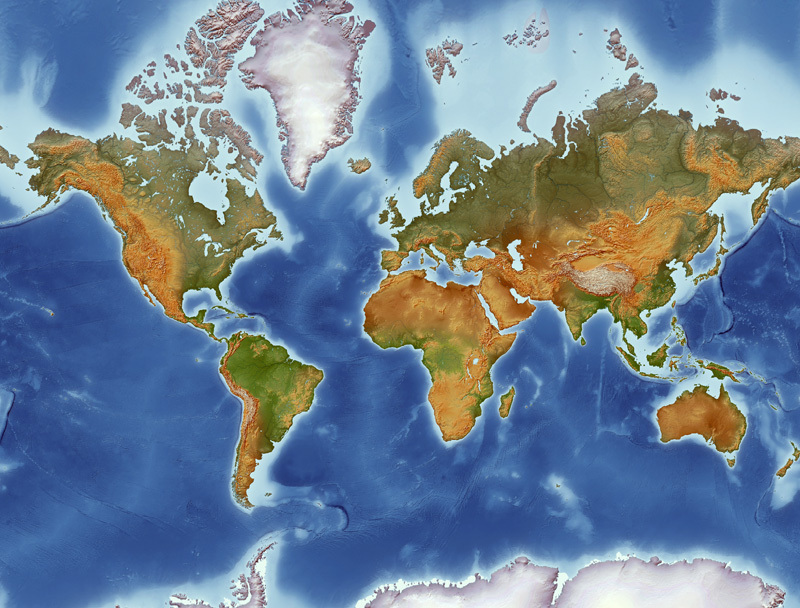 In a normal map of world countries, sizes of the countries are defined by their geographic area. However the map projection below is based on the population of countries, not their geographic area. In our opinion the world language should represent the human world. 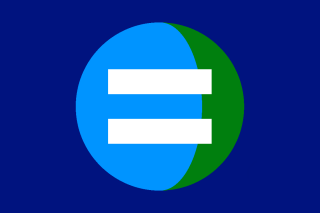 Every part of the world, every culture, should be treated fairly and democratically. The grammar should be easy for all. Areal language characteristics such as Standard Average European are not suitable guidelines for the world language. Rather the grammar should be built from things that are universally known and/or universally considered easy. The 15 most widely spoken languages in the world are listed in the table below. The table is ordered by the number of native speakers. The numbers are educated estimates based on data in Ethnologue and in Wikipedia. The numbers make it clear that Mandarin Chinese is by far the largest language in the world counted by native speakers, while English is the language with the greatest number of second language speakers. Both of their number of speakers reaches one billion. However they are followed by languages, whose speakers are also counted in hundreds of millions. It is estimated that over 6000 different languages are spoken in the world. However, native and non-native speakers of the 5 most widely spoken languages together add up to more than half of the total population of the world. Also these five languages represent different language typologies well and they also represent the five main divisions of international vocabularies. There are many writing systems in the world and a handful of them have become international. Chinese "hanzi" symbols are used in Japanese, where they are known as "kanji". The Arabic script is used for writing Urdu in Pakistan and India. However only the Roman alphabet has become truly global. It is used by numerous European and American languages but also by African language of Africa (including Hausa and Swahili) and by several notable languages in Asia, namely Turkish, Malay-Indonesian and Vietnamese. Standard Chinese is written in Chinese characters, which form a system so complex that school children are taught to read the Roman alphabet first. This system of romanization is known as Pīnyīn. Therefore it is clear why also Pandunia is written in the Roman alphabet. English and Chinese have rich vowel inventories. English has 14-20 vowels, depending on the dialect. Standard Chinese has 9 vowels (and many more vowel qualities). These are comparatively high numbers considering that globally the average vowel inventory size is only 5-6 vowels. Pandunia has only 5 pure vowels: a, e, i, o, u. In this respect, it is close to languages such as Spanish, Swahili, Japanese and Indonesian, which have simple vowel inventories. Pandunia's consonant inventory is smaller than that of English and Mandarin. Majority of the consonant letters are pronounced in the same way in all three languages. The table below shows how consonant sounds are mapped from Pandunia to English and Mandarin. Sounds that are in English or Mandarin but not in Pandunia are enclosed in parenthesis. Syllable patterns vary across languages. For example in Japanese the heaviest syllable type is CVN, where C is a consonant, V is a vowel and N is a nasal consonant. This gives Japanese a very vocalic sound. English, on the other hand, can have very heavy syllables, for example "sprints" (CCCVNCC). Pandunia is somewhere in the middle. Most of the words consist of simple CV syllables but also more complex syllables are allowed, especially for internationally known technical terms. For example kristal (crystal) is considered a complex word in Pandunia. More complex loan words can be dealt with in two ways. Select a simpler variant from another language. For example the word for "project" is taken from the French version: proje. Break the consonant clusters by adding vowels. For example "sport" would become esporte. Many languages do something similar. See Portuguese "esporte" and Japanese "supōtsu" for comparison. English spelling is notoriously irregular. Pīnyīn was created more recently, in the 1950s, but unfortunately it also has some irregularities, simply because there are more sounds in spoken Chinese than there are letters in the Roman alphabet. Still, in comparison to English, Pinyin is very regular. For example the English rhymes my, sigh, lie, and rye would be written in Pīnyīn mai, sai, lai, rai. It is as simple as that! Pandunia has perfect letter-to-sound correspondence. One letter stands for one sound only. One sound is represented by exactly one letter. Every word is pronounced as it is written. Texts in Pīnyīn are loaded with accent marks, as in "Wǒmen yě huì shuō zhōngguòhuá." They mark tones. In Standard Chinese each syllable is pronounced in one of the four tones or in the unmarked neutral tone. English doesn't have word tones but it has word stress. Word stress is variable in English, so the position of stress is unpredictable. In a written expression like "totally fantastic personnel", nothing shows that each word has the stress on a different syllable. If the stress was marked with an accent, it might look something like this: "tótally fantástic personnél". Tones are hard to learn for people who are not used to them. Variable stress is hard to learn for people who are used to fixed stress. Neither word tone nor variable word stress are necessary in the world language. Pandunia has fixed stress. The stress falls on the syllable that is before the last consonant. Like this: me wóla lóga bón dúnia báx. Pandunia doesn't have lexical tone. Is a single word made of few or many parts? Are those parts easy to separate or fused together? The widely spoken languages can be divided into four types according to these parameters. Analytic languages – Words are made of few, distinct parts. Analytic fusional languages – Words are made of few, fused parts. Agglutinative languages – Words are made of many, distinct parts. Synthetic fusional languages – Words are made of many, fused parts. Usually languages are a mixture of different types. For example, in English the plural can be formed in several different ways. Many a cat is an analytic phrase that consists of three separate words. Cats is an agglutinative word that consists of two distincts parts (cat and -s). Leaves is a fused word that consists of two parts (leaf and -s). Pandunia belongs to the first type. It is an analytic language. Its words consist of few parts and they are clearly separable. This is a good thing because it makes the language easy to learn and use in comparison to languages where words in average are long and consist of many parts. Suffixing languages are the most common type. Indo-European languages, Telugu, Chinese and Japanese are mostly suffixing. Chinese has no inflection. Words are only combined into larger words. Some words have a special meaning when they appear as a part of a larger word. These so called bound morphemes are much like suffixes. English, Spanish and Hindustani use mainly root and affix system. The meaning is changed by adding dependent parts before and after the root. For example "booklets" consists of root book and affixes -let (which adds meaning of smallness) and -s (which adds plural meaning). Most affixes can't appear alone, but they need a root. Arabic uses transfixes (also known as the root and pattern system). The root consists of (usually three) consonants and the root is changed by inserting a pattern of vowels between them. Arabic also has many prefixes and suffixes for creating additional words. Pandunia uses root and affix system. The principles of this system are known to most people. New words can be created easily. Sentence structure. Order of subject (S), verb (V) and object (O) in a transitive clause. The most common sentence structures are subject-verb-object (SVO) and object-verb-subject (SOV). Order of numeral and noun. Cardinal numeral can either precede (NumN) or follow (NNum) the noun. Order of adposition and noun. Order of relative clause and noun. The relative clause can either precede (RelN) or follow (NRel) the noun. The table below shows what are the typical, unmarked word orders in several important world languages. Also other word orders can be possible. For example in English, which normally uses the SVO order in declarative sentences, the object can be fronted in interrogative and relative clauses, like in "What did you say?" Languages where the main word comes first have typically SVO, NNum, NAdj, NRel and prepositions. Languages where the main word comes last have typically SOV, NumN, AdjN, RelN and postpositions. Languages with mixed or free word order. The third type is the most attractive for the world auxiliary language, which has to welcome people with many different speaking habits. It doesn't make the language only versatile but also more interesting! Pandunia allows different word orders. This is achieved mainly by the verb endings -a and -u, which signal reverse word orders. In Pandunia verbs can function also as adpositions (so called coverbs). I jump over the high table. English and Spanish carry the heritage of Latin and Greek, which have greatly influenced all languages of Europe, America and beyond, including French, Portuguese, Italian, German, Polish and Russian. Mandarin Chinese carries the Sinitic heritage of Old Chinese, which has greatly influenced all other East Asian languages, including Japanese, Korean, Vietnamese and other varieties of Chinese. Hindi-Urdu carries the heritage of Sanskrit, which has influenced also all other languages of South and South-East Asia, including Bengali, Punjabi, Telugu, Tamil, Burmese, Khmer, Thai, Malay and Indonesian. Arabic and Hindi-Urdu (Urdu more than Hindi) carry the Perso-Arabic heritage, which has greatly influenced languages in Central, South-West, South and South-East Asia and North, West and East Africa, including Turkish, Persian, Bengali, Punjabi, Telugu, Indonesian, Hausa, Wolof, Amharic, Oromo, Somali and Swahili. Typically Western words have this structure: prefix + root + suffixes. Usually the root ends in a consonant. For example in Spanish, the root cort- (short) can be combined with affixes to produce different kinds of words. Also English uses comparable affixes. Pandunia borrows the roots of Western words. The goal is to select a form that sounds familiar to speakers of as many languages as possible. The suffixes of Pandunia are applied on the roots. Here are some resulting Pandunia words: korti (short), korte (shorty), korta (shorten), nowi (new), nowe (news), nowa (renovate). Sinitic words are words from Middle Chinese that are used today in languages of East Asia, including Chinese languages, Japanese, Korean and Vietnamese. Sinitic words are single-syllable words or compounds of syllabic elements. Middle Chinese had unreleased stop consonants, which are usually written -p, -t and -k. Cantonese, Vietnamese and Korean keep them mostly as they were. Mandarin has deleted them. Japanese has added a vowel to ease pronunciation. Pandunia keeps the final stops and adds a normal PoS suffix. Applying the suffixes of Pandunia to Sinitic roots may seem unusual at first, but it is nothing new – Sinitic words are already inflected in Korean! In this section we will compare the sentence structures of Pandunia with English and Chinese, the two most widely spoken languages of the world. The normal sentence word order is subject-verb-object – just like in English and Chinese. English:   I love you, and you love me. Pandunia:  me ama te, te ama me. English:   The apples were eaten. beyu is a loan word from Standard Chinese, but it is also close to some uses of English "to be". English:   It can not be eaten. Pandunia:  le ni bila beyu nyama. Like Chinese, Pandunia doesn't mark verbs with a word like "to". English:   I invite him to drink coffee. Pandunia:  me bita le nyama kafe. English:   It is an apple.